Drew, noted Blue Tribe Climatologist, insists that a typhoon is headed their way so the tribe must reinforce the palm frond roof on their structure. Then, he takes a nap. In my several dozen years of watching Survivor, I have gained a bit of insight into the game and can say with a great deal of confidence that sleeping is never, ever, ever a good strategy. But this episode is not about Drew. It is about the orangey tribe’s three hundred pound simmering boil, John Rocker. At the Reward Challenge, Jeremy sees that Val was voted out of her tribe. He is understandably pissed and shoots John Rocker eye-daggers. Rocker then demonstrates his moronitude and apologizes to Jeremy, claiming he did everything that he could to protect Val but his alliance would not go along with him so he had to give in and vote Val out of the tribe. And he said that in front of his own tribe. They’re all like, “huh? Did he just say that he has an alliance with Jeremy?” Yes, yes he did. Because John Rocker is an idiot. The Reward Challenge pits Wes versus his papa Keith in a balancing pizza-like board stacking game. Keith craps out and the sunshine tribe wins its first challenge of the season. They choose the fishing gear that was forfeited at the last challenge as their reward. Oh, and Wes picks Josh to go to Exile Island with his father. Once at Exile Island, Keith and Josh share the clue to the Immunity Idol and plan to search for it back at their camps. Then, it’s snail smashing and eating time. Back at camp, Jeremy tells his blue tribe who John Rocker is and what he said. “So he’s a bigot?” Yes, yes he is. But, awkward! Rocker’s girlfriend is, like, right there. Well, I’m sure it’s nothing she hasn’t heard before. The Immunity Challenge looks like a doozy! It’s like someone bought all of the Tinker Toys on the planet, enlarged them by a bazillion percent, and dumped them on a Nicaraguan beachfront. Tribemates are tethered together in twos and must crawl and climb through the stick maze to retrieve a ball and toss it into a basket. The first pair to get the ball into the basket scores a point for their tribe, and three is the magic number. One point for the blue tribe, one point for the orangey tribe, another point for the orangey tribe, Josh spider monkeys through the course dragging Baylor behind…but then Baylor misses the basket. Before they can retrieve their air ball, one point for the blue team. With the game tied, things get a little ugly under the sticks. In the end, the blue team pulls out a win. Then, Twinnie finally opens her big mouth about John Rocker being a racist and homophobe. And did he just threaten to knock Twinnie’s teeth out? Yes, yes he did. Nice. If the orangey tribe has any sense (and I’m not sure that they do), they’d get rid of that giant, hulking mass of crud at Tribal Council. So the yellow-orange-yellow tribe beach is…interesting. Baylor needs to scramble since she had multiple votes at the last Tribal Council. Oh hahahaha, John Rocker just said that he can’t be a homophobe because he’s got a gay ally on the tribe! That’s like not even saying you have a gay friend. Well, John Rocker’s gay ally hatches a plan with Wes, Baylor, and Alec to get rid of him. Alec is not necessarily down with the plan since John is their biggest guy, so we’ll see. Let’s just get down to business. Tribal Council. 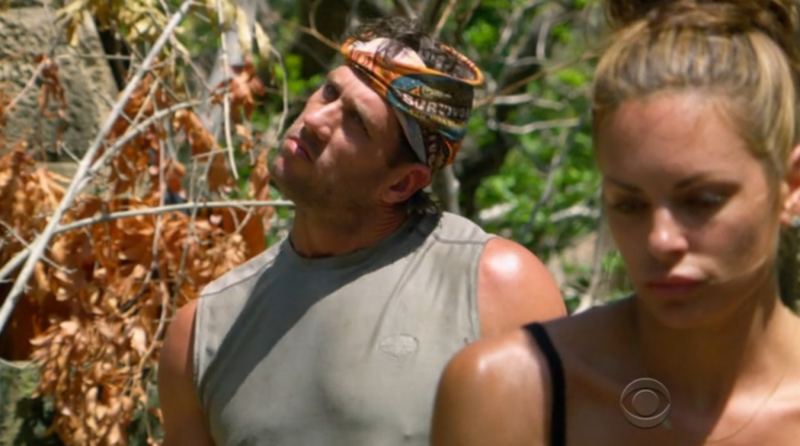 Mushybrains John Rocker fails to play his Immunity Idol, and the votes are Baylor, John, Baylor, John, John, John. Boom! And that’s how this game is played! Good on them, and goodbye, loser. Go home with an Idol in your pocket. And fire your publicist for mistakenly thinking that this could rehab your image. Ha!